This was a terrifically hard fought game. 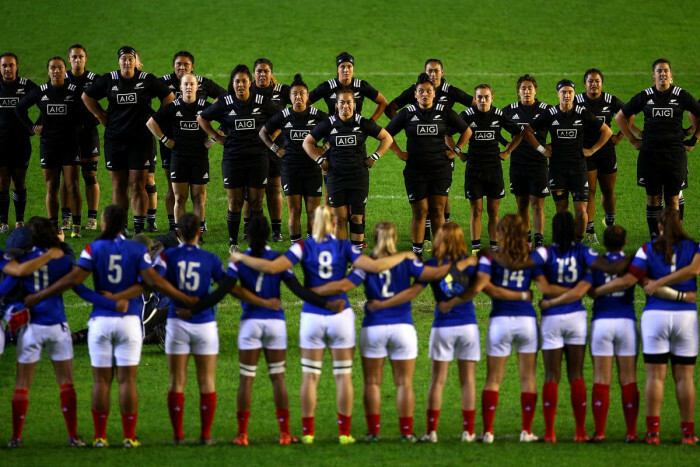 Les Bleues – remarkably hosting the Black Ferns for the first time - were on top for much of the first half, before lifting the pressure a little in the second half, allowing the Black Ferns to take the opportunity to score two tries. But despite their defeat overall the young French have shown their ability and have eight days Saturday, November 17 to tighten up on details that made the difference. New Zealand found the second game of their Autumn tour rather different to the first in Chicago last weekend. They were more than matched for much of the game at the Mayol Stadium in Toulon. It was a fierce battle! The two teams were perfectly balanced, each putting everything into attempts to pierce intractable defences. There were chances, by New Zealand winger Ayesha Leti-I'Iga (14) and French backrow Romane Ménager (19), but these were frustrated by a ball made slippery by continuous rain. At half-time, irresistible force had come up against immovable object and the two nations were left on a surprising score of ... 0-0. But at the end of the break, the Fens returned reinvigorated. Unable to break the French defence by using their backs, Glenn Moore’s team switched tactics and used the power of their forwards around the rucks. A strategy immediately paid off with a try by second row Eloise Blackwell (53m), converted by Kendra Cocksedge (7-0). The French were now starved of the ball and five minutes later the New Zealanders scored a second try, corner, through the winger Renee Wickliffe. At 14-0, the hopes of a first official French victory against the Blacks Ferns seemed to have disappeared, but they kept battling until the end of the match, finally crossing the Ferns line in the last minute only for Boujard’s try to be disallowed owing to an earlier infringement by Jason.